This paper presents the systematic procedure of the modeling and simulation of a Distribution STATCOM (DSTATCOM) for power quality problems, voltage sag and swell based on Sinusoidal Pulse Width Modulation (SPWM) technique. Power quality is an occurrence manifested as a nonstandard voltage, current or frequency that results in a failure of end use equipments. The major problems dealt here is the voltage sag and swell. To solve this problem, custom power devices are used. One of those devices is the Distribution STATCOM (D-STATCOM), which is the most efficient and effective modern custom power device used in power distribution networks. D-STATCOM injects a current in to the system to correct the voltage sag and swell.The control of the Voltage Source Converter (VSC) is done with the help of SPWM. The proposed D-STATCOM is modeled and simulated using MATLAB/SIMULINK software. Fig. 2. Voltage Vrms at load point, with three-phase fault: (a) Without DSTATCOM and (b) With D-STATCOM, 750I-lf . Without D-STATCOM and (b) With D-STATCOM. Fig. 4. Voltage Vrms at load point, with line-ground fault: (a) Without DSTATCOM and (b) With D-STATCOM. Fig. 5. Voltage vrms at load point, with line-line fault: (a) Without DSTATCOM and (b) With D-STATCOM. D-STATCOM and (b) With D-STATCOM. This paper has presented the power quality problems such as voltage sags and swell. Compensation techniques of custom power electronic device D-ST ATCOM was presented. The design and applications of D-STATCOM for voltage sags, swells and comprehensive results were presented. The Voltage Source Convert (VSC) was implemented with the help of Sinusoidal Pulse Width Modulation (SPWM). The control scheme was tested under a wide range of operating conditions, and it was observed to be very robust in every case. For modeling and simulation of a D-ST ATCOM by using the highly developed graphic facilities available in MA TLAB/SIMULINK were used. The simulations carried out here showed that the D-STATCOM provides relatively better voltage regulation capabilities. [I] O. Anaya-Lara, E. Acha, “Modeling and analysis of custom power systems by PSCAD/EMTDC,” IEEE Trans. Power Delivery, vol. 17, no .I, pp. 266-272, January 2002. S. Ravi Kumar, S. Sivanagaraju, “Simualgion of D-Statcom and DVR in power system,” ARPN jornal of engineering and applied science, vol. 2, no. 3, pp. 7-13, June 2007. H. Hingorani, “Introducing custom power”, IEEE Spectrum, vol. 32, no.6, pp. 41-48, June 1995. N. Hingorani, “FACTS-Flexible ac transmission systems,” in Proc. IEE 5th Int Conf AC DC Transmission, London, U.K., 1991, Conf Pub. 345, pp. 1-7. Mahesh Singh, Vaibhav Tiwari, “Modeling analysis and soltion to power quality problems,” unpublished. STATCOM (static synchronous compensator) as a shunt-link flexible AC transmission system(FACTS) controller has shown extensive feasibility in terms of cost-effectiveness in a wide range of problem solving abilities from transmission to distribution levels. Advances in power electronic technologies such as Voltage Source Converter (VSC) improves the reliability and functionality of power electronic based controllers hence resulting in increased applications of STATCOM. In this paper, design and implementation of a Distribution type, Voltage Source Converter (VSC) based static synchronous compensator (DSTATCOM) has been carried out. It presents the enhancement of power quality problems, such as voltage sag and swell using Distribution Static Compensator (D-STATCOM) in distribution system. The model is based on Sinusoidal Pulse Width Modulation (SPWM) technique. The control of the Voltage Source Converter (VSC) is done with the help of SPWM. 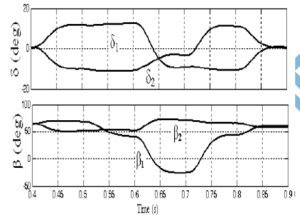 The main focus of this paper is to compensate voltage sag and swell in a distribution system. To solve this problem custom power devices are used such as Fixed Compensators (FC, FR), Synchronous Condenser, SVC, SSSC, STATCOM etc. Among these devices Distribution STATCOM (DSTATCOM) is the most efficient and effective modern custom power device used in power distribution networks. DSTATCOM injects a current into the system to mitigate the voltage sag and swell. The work had been carried out in MATLAB environment using Simulink and SIM power system tool boxes. The proposed D-STATCOM model is very effective to enhance the power quality of an isolated distribution system feeding power to crucial equipment in remote areas. The simulations were performed and results were found to be satisfactory using MATLAB/SIMULINK. Fig.6 The waveforms shows THD (41.31%) results of fixed load and variable inductive load. The simulation results show that the voltage sags can be mitigate by inserting D-STATCOM to the distribution system. By adding LCL Passive filter to D-STATCOM, the THD reduced. The power factors also increase close to unity. Thus, it can be concluded that by adding DSTATCOM with LCL filter the power quality is improved. A.E. Hammad, Comparing the Voltage source capability of Present and future Var Compensation Techniques in Transmission System, IEEE Trans, on Power Delivery. Volume 1. No.1 Jan 1995. Haque, M.H., “Compensation of Distribution Systems Voltage sags by DVR and D STATCOM”, Power Tech Proceedings, 2001 IEEE Porto, Volume 1, PP.10-13, September 2001. Anaya-Lara O, Acha E., “Modeling and Analysis Of Custom Power Systems by PSCAD/EMTDC”, IEEE Transactions on Power Delivery, Volume 17, Issue: 2002, Pages: 266 272. In this paper, a method is presented to control offshore wind farm output power. This method is able to fix the wind farm output power even during wind speed variations. In the proposed method, the offshore wind farm is connected to the onshore grid through the high-voltage dc (HVdc) cable. Moreover, the power control of the wind turbines is achieved by controlling the HVdc convertors. In the proposed system, the generator side convertors have to control the active power absorbed from the wind, and the grid side ones are obtained to control the HVdc link voltage. The control system is based on applying the appropriate modulation index to the voltage source converters. Two control strategies are proposed and analyzed to control wind farm output power. The simulation results illustrate that the proposed method is able to smooth the output power of the offshore wind farms appropriately. The proposed wind farm configuration and the control system are validated by simulations in the MATLAB/Simulink environment. Fig. 1. Proposed configuration of wind turbines connection. Fig. 2. (a) Wind speed variations (m/s). (b) Turbine rotational speed (rad/s). Fig. 3. HVdc link voltage. Fig. 4. Wind farm output power. In this paper, the configuration and control methods have been proposed for the offshore wind turbines, connected to the onshore grid. This method is capable to control and smooth the wind farm output power, injected to the onshore grid. The proposed system can mitigate the fluctuations of wind farm output power, even during wind speed variations. In other words, the wind farm can operate such as a PQ-bus. Moreover, two strategies (fixed power and MPPT) have been analyzed and compared with each other. Finally, the proposed method is compared with other similar works to smooth the output power of the wind farm. The main result is that the proposed method can smooth the output power better than the TSR, PAC, and OTC methods. But it is a bit weaker than the KEC method in power smoothing issue. Moreover, using this method, the wind farm is able to cooperate in frequency control of the onshore grid by controlling the desired active power, to improve the power system operation, which is the future work of the authors. J. O. Dabiri, “Potential order-of-magnitude enhancement of wind farm power density via counter-rotating vertical-axis wind turbine arrays,” J. Renew. Sustain. Energy, vol. 3, no. 4, p. 043104, 2011. J. Hua, “A floating platform of concrete for offshore wind turbine,” J. Renew. Sustain. Energy, vol. 3, no. 6, p. 063103, 2011. A. Urtasun, P. Sanchis, I. S. Martín, J. López, and L. Marroyo, “Modeling of small wind turbines based on PMSG with diode bridge for sensorless maximum power tracking,” Renew. Energy, vol. 55, pp. 138–149, Jul. 2012. M. Kesraoui, N. Korichi, and A. Belkadi, “Maximum power point tracker of wind energy conversion system,” Renew. Energy, vol. 4, no. 10, pp. 2655–2662, 2011. This paper presents a new unified power-quality conditioning system (MC-UPQC), capable of simultaneous compensation for voltage and current in multibus/multifeeder systems. In this configuration, one shunt voltage-source converter (shunt VSC) and two or more series VSCs exist. The system can be applied to adjacent feeders to compensate for supply-voltage and load current imperfections on the main feeder and full compensation of supply voltage imperfections on the other feeders. In the proposed configuration, all converters are connected back to back on the dc side and share a common dc-link capacitor. Therefore, power can be transferred from one feeder to adjacent feeders to compensate for sag/swell and interruption. The performance of the MC-UPQC as well as the adopted control algorithm is illustrated by simulation. The results obtained in PSCAD/EMTDC on a two-bus/two-feeder system show the effectiveness of the proposed configuration. Fig. 1. Typical MC-UPQC used in a distribution system. Fig. 2. Control block diagram of the shunt VSC. Fig. 3. Control block diagram of the series VSC. Fig. 4. BUS2 voltage, series compensating voltage, and load voltage in Feeder2. Fig. 5. Nonlinear load current, compensating current, Feeder1 current, and capacitor voltage. Fig. 6. Simulation results for an upstream fault on Feeder2: BUS2 voltage, compensating voltage, and loads L1 and L2 voltages. Fig. 7. Simulation results for load change: nonlinear load current, Feeder1 current, load L1 voltage, load L2 voltage, and dc-link capacitor voltage. Fig. 8. BUS1 voltage, series compensating voltage, and load voltage in Feeder1 under unbalanced source voltage. 3) sharing power compensation capabilities between two adjacent feeders which are not connected. D. D. Sabin and A. Sundaram, “Quality enhances reliability,” IEEE Spectr., vol. 33, no. 2, pp. 34–41, Feb. 1996. M. Rastogi, R. Naik, and N. Mohan, “A comparative evaluation of harmonic reduction techniques in three-phase utility interface of power electronic loads,” IEEE Trans. Ind. Appl., vol. 30, no. 5, pp. 1149–1155, Sep./Oct. 1994. F. Z. Peng, “Application issues of active power filters,” IEEE Ind. Appl. Mag., vol. 4, no. 5, pp. 21–30, Sep../Oct. 1998. H. Akagi, “New trends in active filters for power conditioning,” IEEE Trans. Ind. Appl., vol. 32, no. 6, pp. 1312–1322, Nov./Dec. 1996. 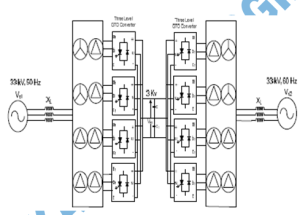 L. Gyugyi, C. D. Schauder, S. L. Williams, T. R. Rietman, D. R. Torjerson, and A. Edris, “The unified power flow controller: A new approach to power transmission control,” IEEE Trans. Power Del., vol. 10, no. 2, pp. 1085–1097, Apr. 1995. This paper presents an implementation of an adaptive filter in a three-phase distribution static compensator (DSTATCOM) used for compensation of linear/nonlinear loads in a three-phase distorted voltage ac mains. The proposed filter, which is based on adaptive synchronous extraction, is used for extraction of fundamental active- and reactive-power components of load currents in estimating the reference supply currents. This control algorithm is implemented on a developed DSTATCOM for reactive-power compensation, harmonics elimination, load balancing, and voltage regulation under linear and nonlinear loads. The performance of DSTATCOM is observed satisfactory under unbalanced time-varying loads. Fig.1. Schematic of three-leg DSTATCOM. Fig. 2. (a), (b), and (c) Various intermediate signals of the control algorithm at load injection. (a) Ch. 1 and 2: 200 V/div; Ch. 3 and 4: 20 A/div; Time axis: 50 ms/div. (b) Ch. 1, 2, 3, and 4: 20 A/div; Time axis: 20 ms/div. (c) Ch. 1, 2,3, and 4: 20 A/div; Time axis: 20 ms/div. Fig. 3. 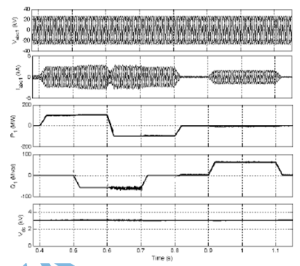 Steady-state performance of DSTATCOM at linear lagging PF load in PFC mode. (a) Ps. (b) PL. (c) Pc. (d) vab, isa. (e) vbc, isb. (f) vca, isc. Fig. 4. 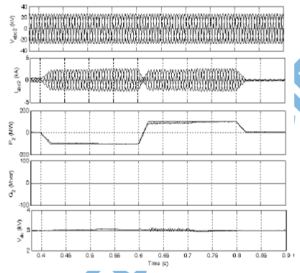 Steady-state performance of DSTATCOM at nonlinear loads in PFC mode. (a) vab, isa. (b) vbc, isb. (c) vca, isc. (d) Harmonic spectrum of isa. (e) vab, iLa. (f) Harmonic spectrum of iLa. Fig. 5. Dynamic performance of DSTATCOM at unbalanced linear loads. (a) vab, isa, isb, isc. (b) vab, iLa, iLb, iLc. (c) vdc, isa, iCa, iLa. Fig. 7. Steady-state performance of DSTATCOM at linear lagging PF load in ZVR mode. (a) Ps. (b) PL. (c) Pc. (d) vab, isa. (e) vbc, isb. (f) vca, isc. Fig. 8. Steady-state performance of DSTATCOM at nonlinear load in ZVR mode. (a) vab, isa. (b) vbc, isb. (c) vca, isc. (d) Harmonic spectrum of isa. (e) Harmonic spectrum of iLa. (f) iCa. (g) Ps. (h) PL. Fig. 9. Variation of Vt, isa, and iLa with vdc under unbalanced linear loads. A DSTATCOM has been implemented for a three-phase distribution system. An AF has been used for control of DSTATCOM. This AF has been found simple and easy to implement, and its performance has been observed satisfactory with nonsinusoidal and distorted voltages of ac mains under load variation. The performance of DSTATCOM with its AF has been demonstrated for harmonics elimination, reactivepower compensation, and load balancing with self-supporting dc link in PFC and ZVR modes. The dc-link voltage of the DSTATCOM has been also regulated to a desired value under time-varying load conditions. E. F. Fuchs and M. A. S. Mausoum, Power Quality in Power Systems and Electrical Machines. London, U.K.: Elsevier, 2008. H. Akagi, E. H. Watanabe, and M. Aredes, Instantaneous Power Theory and Applications to Power Conditioning. Hoboken, NJ, USA: Wiley, 2007. A. Emadi, A. Nasiri, and S. B. Bekiarov, Uninterruptible Power Supplies and Active Filters. Boca Raton, FL, USA: CRC Press, 2005. J. Jacobs, D. Detjen, C. U. Karipidis, and R. W. De Doncker, “Rapid prototyping tools for power electronic systems: Demonstration with shunt active power filters,” IEEE Trans. Power Electron., vol. 19, no. 2, pp. 500– 507, Mar. 2004. A. Ghosh and G. Ledwich, Power Quality Enhancement Using Custom Power Devices. New Delhi, India: Springer Int. Edition, 2009. From the simulation results using Simulink dynamic models, it can be shown that these controllers provide the microgrid with a deterministic and reliable connection to the grid. Fig.1. Dynamic model of microgrid with controller. Current and voltage Control techniques have been developed for grid connected and intentional islanding modes of operation using PI controllers. An intentional islanding detection algorithm responsible for switching between current control and voltage control is developed using logical operations and proved to be effective. The reconnection algorithm coupled with the synchronization controller enabled the DG to synchronize itself with the grid during grid reconnection. The performance of the microgrid with the proposed controllers and algorithms has been analyzed by conducting simulation on dynamic model using SIMULINK. The simulation results presented here confirms the effectiveness of the control scheme. L. Shi, M.Y. Lin Chew. “A review on sustainable design of renewable energy systems,” science direct journal present in Renewable and Sustainable Energy Reviews, Vol. 16, Issue 1, 2012, pp. 192–207. Q. Lei, Fang Zheng Peng, Shuitao Yang. “Multi loop control method for high performance microgrid inverter through load voltage and current decoupling with only output voltage feedback,” IEEE Trans. power. Electron, vol. 26, no. 3, 2011, pp. 953–960. 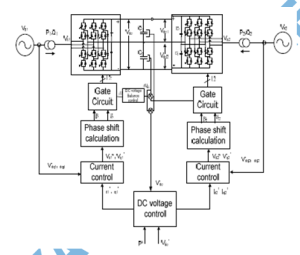 J. Selvaraj and N. A. Rahim, “Multilevel inverter for grid-connected PV system employing digital PI controller,” IEEE Trans. Ind. Electron., vol. 56, no. 1, 2009, pp. 149–158. I. J. Balaguer, Fang Zheng Peng, Shuitao Yang, Uthane Supatti Qin Lei. “Control for grid connected and intentional islanding modes of operations of distributed power generation,” IEEE Trans. Ind. Electron., vol. 56, no. 3, 2009, pp. 726–736. R. J. Azevedo, G.I. Candela, R. Teodorescu, P.Rodriguez , I.E-Otadui “Microgrid connection management based on an intelligent connection agent,” 36th annual conference on IEEE industrial electronics society, 2010, pp. 3028–3033.